Hailey has been at Manhattan Broadcasting Company since January 2018. 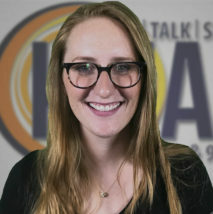 Starting as an intern, she graduated from K-State with a degree in Print Journalism in May. After planning to be a writer, Hailey found radio late in the game. She contributes those skills to KMAN’s website and also produces news stories and audio for broadcast. Hailey was born and raised near Wichita. She grew up visiting “Manhappiness” due to her Aunt Kim, who graduated from K-State, and has bled purple ever since. Hailey’s passion for traveling the globe gives her an eye for stories that start large but still possess a local impact on Kansas or vice versa.